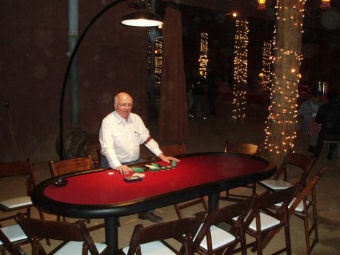 No Limit Texas Holdem Poker is played on a full size oval poker table measuring 84 by 54 inches seating up to 10 players plus a dealer. 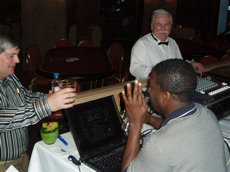 ACE Casino Equipment has the resources to produce your tournament from start to finish including dealers, equipment, accessories, delivery and set-up and emcee tournament coordinator. Typically, we start all participants with a bank between 2,000 and 10,000. During the course of the competition; we eliminate players until we determine the tournament champion. Depending on the parameters of your group, we design a format that works to accomplish your goals, be it a fundraiser, team building exercise, or corporate theme party. 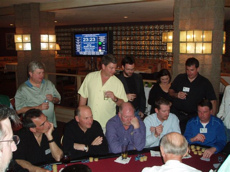 We recommend a minimum of three hours of tournament time to make it enjoyable for your guests. Please contact our office to learn more about the hottest event to hit the social scene in years. 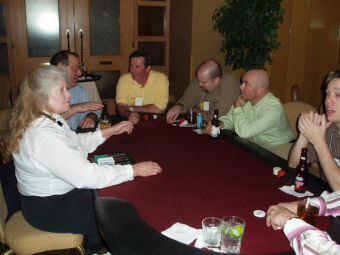 ACE Casino Equipment can provide pros to attend your event. 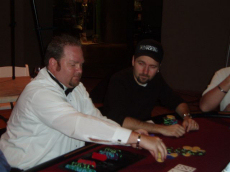 Daniel Negreanu ponders his next move. 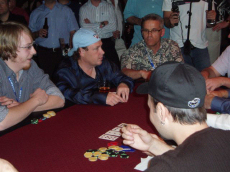 Daniel Negreanu looks on as Gavin Smith explains his strategy. 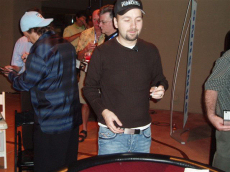 Daniel Negreanu and Gavin Smith sign autographs at the conclusion of the tournament. 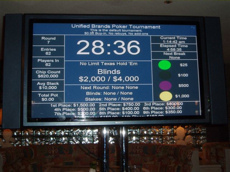 Our optional Texas Hold'em tournament software times the tournament and tracks blinds and player standings. We utilize a laptop and flat panel TVs or large projection screens.